" Theatre arts teachers in high school and middle school will find Zimmerman's new text a treasure. This book not only covers a wide spectrum of topics for the theatre student, but serves as a superbly organized and logical framework for any introductory course in theatre. Theatre Arts covers such areas as acting technique, technical theatre, history, improvisation, publicity and stage production. Students will find the material presented in a clear, concise manner complete with worksheets and games to reinforce learned materials. 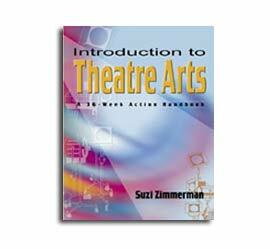 Teachers, particularly those new to educational theatre will find that Suzi Zimmerman has devoted the teacher's guide to creating a theatre program that is fun for the students, and is easy as possible for the teacher. She has included exams, suggestions for establishing a drama club, evaluation tools, forms and awards, and suggestions for auditions. While the material in her book is probably best suited for new theatre programs and teachers, experienced teachers will find a wealth of ideas that may be incorporated into any level course."